The Life Fitness Platinum Club Series Elliptical Trainer is ON SALE! Based on a Popular Health Club Model – It’s Even Better! 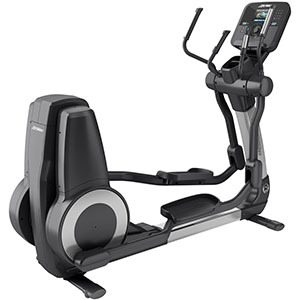 The Life Fitness Platinum Club series elliptical is similar to the basic Club Series Elliptical with the addition of some serious tech on the console. They also added an option to select the color of your ellipticals frame. A choice of 3 consoles includes the Explore, Discover SI or Discover SE3 options. The top SE3 console has a beautiful LCD touchscreen display. Life Fitness machines are some of the very top machines in the industry. After testing one you will understand that they are really in a league of their own in terms of quality, smooth motion, and ergonomics. Unfortunately, their price tag reflects this high level of quality. If you have the money, you can’t go wrong with one of these Life Fitness machines. Life Fitness Platinum Club Series Elliptical Sale! The Life Fitness Platinum Club Series Elliptical typically sells for $4,299. The Platinum Club Series from Life Fitness is a durable design with a variety of entertainment options. Each of the 3 console options comes with Bluetooth technology to connect your media mid-workout. The 16″ Discover SE3 and 10″ SI tablet consoles let you stay entertained while you track your progress towards your fitness goals. The 7″ Explore console has a QuickNav dial for easy navigation through your workout stats. We really like the choice of consoles for the Platinum Club Series machine. The sheer size of the 16″ Discover SE3 console is astounding! The Discover SE3 console also has Android / Apple compatibility, TV, Internet, Bluetooth Interactive Courses, Integrated Apps, up to 42 Workouts, up to 8 Custom Workouts and limitless user profiles. The Discover SI has a 10″ screen and the Explore has a 7″ LCD Non-Touch Screen. Choose what color you’d like your machine’s frame to be with four color options: Arctic Silver, Black Onyx, Diamond White, and Titanium Storm. This machine comes with a choose of three levels of warranty: Standard, 3-year extended, and 5-year extended. The resistance controls are located on the moving bullhorns for easy adjustment. Like its younger brother, the Club Series, the Platinum Club Series has extremely smooth and comfortable motion. It has been designed ergonomically to mimic the motion of your body and reduce stress on your joints. This machine has a variety of programs to try even including a Fit Test and US Navy PRT test! The Platinum Club Series Elliptical has an integrated reading rack and smart phone tray. The unit weight is 452 lbs so it is a STURDY machine. Just don’t plan to move it once you have it placed in your home. This machine is a bit of a space hog at 88.1″ length. It may not fit well in all homes. The stride length of 20″ will be comfortable for most users, but we were disappointed that it doesn’t have adjustable stride lengths for this price. The price on this machine is pretty high. You’re getting an awesome machine, but you’re certainly paying for it. Remember that Life Fitness Machines are built for people who are serious about getting the best workout available! Also see the Life Fitness Club Series Elliptical Review.